The challenge of our design competition at Audible was to reimagine our current Product Detail Page for the future and redesign it within 48 hours. 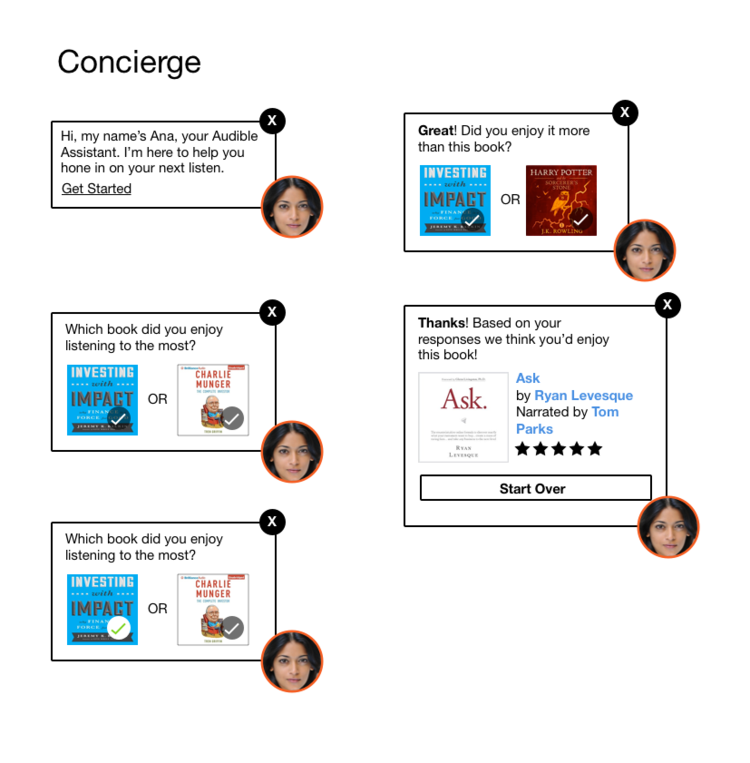 Our team of 2 designers who the competition with the idea to add an AI concierge that helps users find books based on their interests while also improving the algorithm for book recommendations, each time they use it. We added a 10 minute sampling for Audio books that lets users decide which part of a book they want to listen to and to give them the ability to see what their friends are listening to. Another idea was to add a sticky wish list to the bottom of the page that would automatically purchase the books a user added with their next credit. The web sales-checkout needed to be redesigned with the goal to visually differentiate it from the main shopping experience. I designed an expandable tray on the bottom of the screen that follows the user to any page. To visually differentiate from the usual shopping experience, I designed a dark theme.